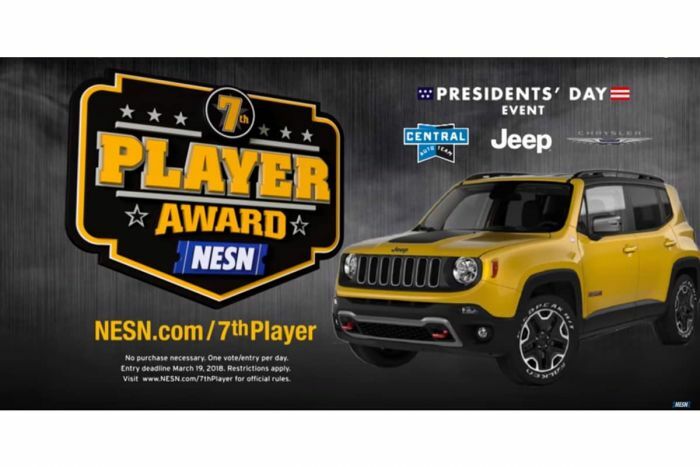 As part of the Boston Bruins' 49th annual 7th Player Award, a lucky family was given the keys to a Jeep Renegade Sport. For 49 years, the Boston Bruins have named a 7th Player award winner. The 7th Player Award goes to that player who has risen above and performed beyond the expectations of fans. This year's winner is rookie defenseman, Charlie McAvoy. Unlike some other professional sports leagues who give millionaire sports figures vehicles as a prize when they win an MVP award, Boston's Bruins organization, and its broadcaster NESN instead decided a number of years back to arrange for a fan family to drive home in a new car. All we fans have to do to be eligible is to vote. Yes, the 7th Player Award is determined by fan expectations. This year, the fan winners were Tom and Daniel Ledger from Enfield, CT. They were presented with a new Jeep Renegade lease for three years by Central Chrysler Jeep Dodge Ram of Norwood & The Central Auto Team. NESN will also donate $5,000 to the charity of Charlie McAvoy's choice. Back in the days of wooden ships and iron men, Bruins players often worked summers painting houses to make ends meet. Thankfully, things have changed and every player is now well-paid. One of the prior generation of Bruins to have won a 7th Player Award is NESN color commentator Barry Pederson. During a game break in a previous year, Pederson explained how when he won and was given a pickup truck as a rookie the vehicle became his daily driver. He loved it so much he never traded it and that 7th Player Award truck was used by multiple family generations. Charlie McAvoy is the most recent exciting defenseman in a town that appreciates a good D-man ever since Bobby Orr changed the position forever. Like teammate Torry Krug, McAvoy can move the puck and jump into the play in the offensive zone and add a scoring threat that opponents have a hard time managing. McAvoy has scored in every scenario in his less than one season with the B's. He has scored in five on five situations, overtime, and has also scored a game-winner in a shootout. McAvoy also finishes his hits and fights his own battles despite having three of the league's toughest characters, Zdeno Chara, Kevan Miller, and Adam McQuaid, as a linemate on most shifts. That may earn him the most respect of all in Boston. McAvoy has been out with a sprained knee and missed part of the season with a heart ailment. He is scheduled to return to the line-up this week, just in time for the playoffs.